Goa, with its exotic natural vistas and seductive charm, keeps mesmerising the visitors all the year round. However, during the monsoons, its charm attains an epicness that is hard to resist. Rain washes everything up, turning the land into a quintessential tropical paradise – with lush greenery reining all corners, swaying palm trees, shiny paddy fields, sparkling colourful houses, and more than fifty shades of green all around. The icing on this ‘tropical paradise’ cake is the fact that Goa is less crowded this time of the year, thanks to the burgeoning seas and rolled up shacks. So if one is not too fond of the crowds and wishes to enjoy Goa at a leisurely pace, monsoons are the best time to be here. If you are heading to Goa anytime soon, make the most of the seasonal discounts available at most of the hotel properties. While Goa has no dearth of accommodations catering to all kinds of budget, many top rated Goa resorts offer a stay that defines luxury and indulgence. Here’s a list top 5 best resorts in Goa that offer exclusive service and great amenities for a luxurious stay. The Lalit Golf & Spa Resort is a gorgeous beach resort spread across 85 acres of beautiful landscaped gardens. Situated in Canacona in south Goa, this exquisite beach-front property is built on Portuguese architecture and offers stay in luxurious suites and lavish private villas. Besides a kilometre long private beach, another USP of the Lalit Resort is the international standard golf course and Rejuve – it’s signature spa which is the second largest luxury spa in Goa. The Taj Exotica is considered one of the most lavish properties in Goa. Built with Mediterranean architectural inspiration, this exotic resort is located in Benaulim in south-west Goa and is just 5 kilometres away from the popular Colva beach. While the Taj Exotica boasts of all the modern luxuries and amenities that both leisure and business travellers can ask for, what wins the deal for guests is the spectacular sea view which most rooms offer to its guests. The Leela Beach Resort looks magical. Set amidst a particularly picturesque landscape of palm-fringed lagoons, every room of this property offers a spell binding view of nature’s bounties. 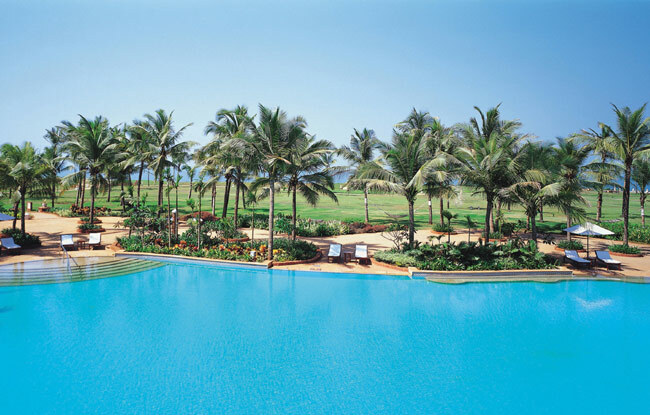 The resort is located on Mobor beach in south Goa, and has its own private beach and a 12 course golf course. So if you are looking forward to take a break from the travails of fast city life, the Leela Goa is the perfect place to unwind and rejuvenate. The pristine white-sand beach, the beautiful lagoons with lotus flowers in bloom, and the serenity will cheer you up just fine. 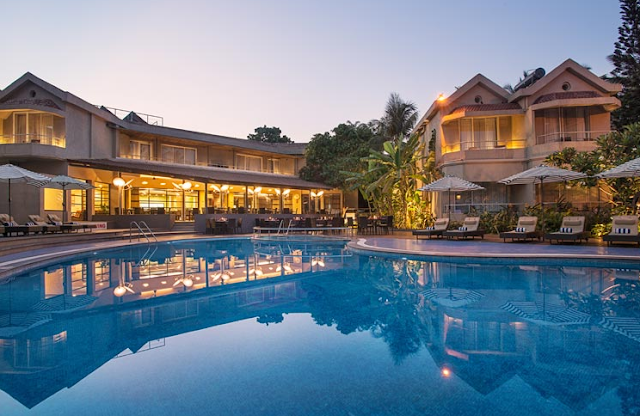 An elegant mix of contemporary design and traditional Goan aesthetic sense, The Whispering Palms Beach Resort is a posh property with a variety of stay options. Located just a few kilometres from the Candolim beach in south Goa, this resort offers a wide range of services and amenities to the guests. Besides a wide range of entertainment and interactive activities for the guests, the resort also offers outdoor activities like water skiing, dolphin rides and fishing trips. 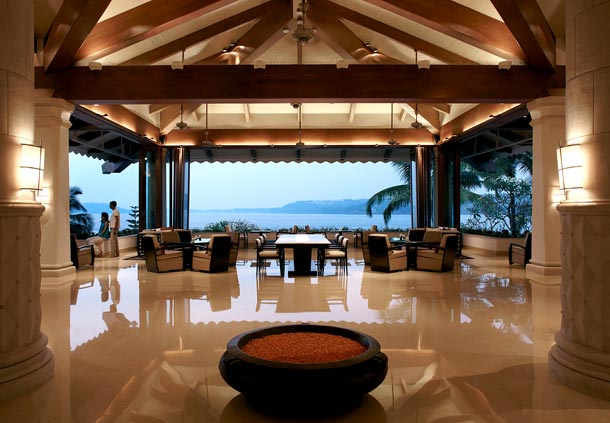 The Goa Marriott Resort & Spa figures among the best premium resorts in Goa. Built on the Miramar beach in Panji, this expansive property boasts of rich, elegant décor and a wide range of amenities. 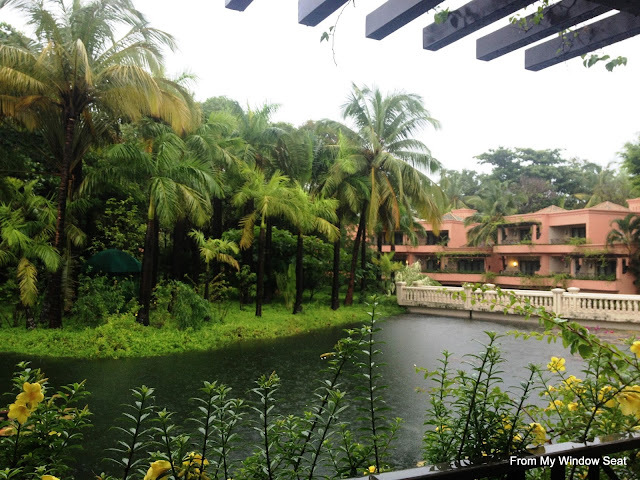 Most part of this resort offers sweeping delightful views of the bay and can rejuvenate weary travellers in a jiffy! Besides the mesmerising views, a range of comfortable services offered with impeccable hospitality will ensure that you have an ultimate vacationing experience in Goa. So contemplate no more and pack your bags for Goa. With these gorgeous resorts to pick from, I am sure you will have the best time of your life there! And if you have already stayed at one of these resorts, do share your stay experience. Wow! Great list! Thanks for sharing. Interesting list! All the five properties listed here are worth the money they charge. Can you put up a detailed review of Leela Resorts please? Pics are too good. Great list. Thanks for stopping by Nischal and glad you like the post! Thanks Sandeep. Yes all the properties I have listed are my personal favourites. The last time I was in Goa, I had stayed at the Leela Resorts. Will share the review soon. Yes, Taj Exotica is a gorgeous property. I somehow find it's layout and design very similar to The Lalit, Goa. Well, its surprising that Grant Hyatt and Alila Diwa didn't feature in your top 5. Interesting list. Have stayed at a couple of them and they deserve a place in this list. Thanks Roma! Glad you enjoyed the post and found it useful. Thank you. Shashi! Glad you enjoyed the post. Nice blog.. Good job.. Sound good.. All the resorts are looking awesome. Try to visit once in a lifetime. Thank you so much for the information. It’s a great post…I love travelling and want to travel all over the world. Explore new places, adventurous things and many more. And photographs are just amazing. Keep writing !! !